The SDO website is back up and running. Due to anticipated power grid problems caused by Hurricane Sandy the SDO website has been shutdown. We regret the inconvenience. The website should return tomorrow. 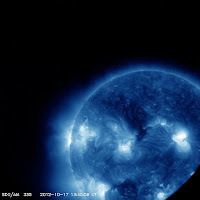 All SDO data is sent to the ground and stored at the data centers. 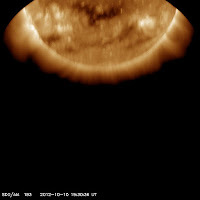 Current SDO images can be found at LMSAL's Sun Today website and the JSOC at Stanford. 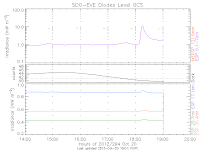 EVE data is available at the EVE space weather data page. Stay safe and dry; hopefully we will be back online soon. Last night AR 11598 unleashed an X1.8 flare, reaching peak brightness at 10/23/2012 0322 UTC in AIA 94. This active region has produced quite a few flares since rotating into the view of SDO. With sunspot number currently at 86, perhaps even more active is at hand. The data handling problems have been fixed and data is flowing normally. Due to problems at the SDO ground station some HMI data was not being transmitted correctly this weekend. Another anomaly at Stanford has introduced further problems. Once the computers are all fixed and talking to each other the data flow will return to normal. We had a bright flare, exceeding an M5 today at 1815 UTC. 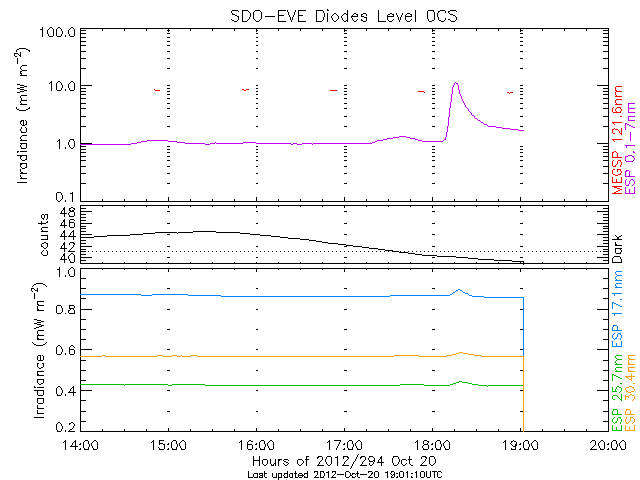 It can be seen as the rise in the ESP 0.1-7 nm channel at the top of this plot. The active region that flared was on the approaching limb of the Sun. SDO successfully wobbled around yesterday and completed the EVE field-of-view and AIA/HMI Flatfield maneuvers. Here is an example of an AIA 335 image during the maneuvers. You should notice that the CCD does not receive light in little segments near the corners of the image. These cutouts are caused by masks in the telescope that block the light and make a more or less round image region on the CCD. This was done because little light from the Sun goes to those parts of the detectors and we squeeze a little more bandwidth out of the telemetry downlink by knowing those triangles have no signal. Last Wednesday SDO performed an EVE Cruciform maneuver, where the spacecraft points up and down and then side to side. This allows the EVE scientist to track the calibration of the instrument and provide the accurate EUV spectral irradiances they are famous for. But it also causes some of the images from AIA and HMI to be blurred (such as this one in AIA 193). Next maneuver is tomorrow, October 17, when we do the EVE field-of-view and HMI/AIA flatfield maneuvers. 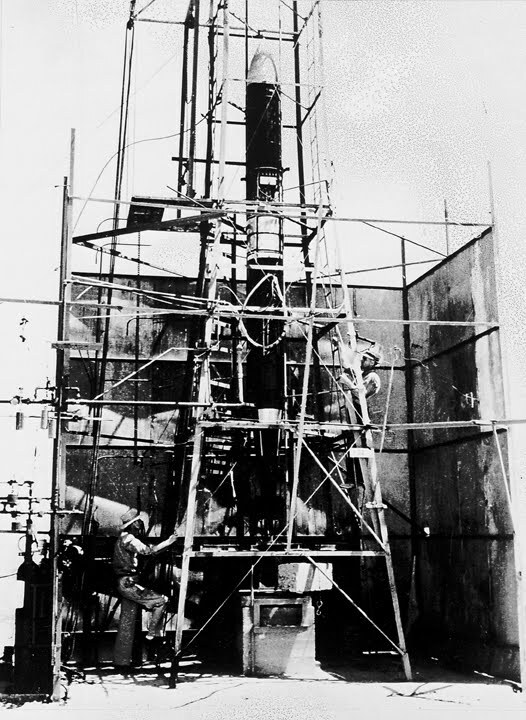 Robert H. Goddard, the inventor of the rockets that make spaceflight possible and the namesake of the Goddard Space Flight Center, was born this day in 1882. Goddard was born in Worcester, Massachusetts and grew up reading popular science fiction. He received patents for liquid-fueled and multi-stage rockets by 1914. While working at Clark University he used ballistic pendulua to show rockets worked in a vacuum and could be used to travel through space. Further work on rockets meant moving to New Mexico where the wide open spaces were a better place for testing. Goddard's early work was ridiculed by the press. He once responded to a reporter's question with, "Every vision is a joke until the first man accomplishes it; once realized, it becomes commonplace." When Goddard died on August 10, 1945 he held 214 patents involving rockets and rocket propulsion. Happy Birthday Dr. Goddard. You left the world a more interesting place. Goddard and his extreme altitude rocket. Courtesy of NASA/MSFC. Today at 1830 UTC (2:30 pm ET) we will perform the HMI roll maneuver. The images are usually oriented to solar north before we see them, but sometimes we get the watch the Sun appear to spin around. It keeps the instruments in good shape and allows the scientists to study the shape of the Sun. A recent article in Science magazine describes the surprising result that came from combining SDO and other measurements of the solar shape. The Sun is slightly oblate but less so than expected and without a change over the solar cycle. More data is needed to understand why the Sun doesn't quite behave as we think it should.